In the 1970s, during the ruinous 30-year dictatorship of General Mobutu, periodic rebellions required the hasty insertion once again of Belgian and French paratroops to save European lives. From the mid-1990s the country split again, becoming the battleground for the largest African war in history, as armies and rebel groups from Rwanda, Angola, Zimbabwe, Uganda, Namibia and other countries crossed into the Congo to support one side or the other, or simply to loot the rich resources. Major operations ended - or paused - in 2002, but the old hatreds and constant lure of the Congo's natural resources continue to boil over into periodic outbreaks. Featuring specially commissioned full-colour artwork and rare photographs, this is the harrowing story of the wars that ravaged the Congo for four decades. Peter Abbott is a retired university lecturer. 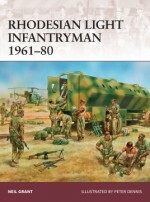 He has written or co-authored a number of Men-at-Arms titles for Osprey, including Men-at-Arms 379: Armies in East Africa 1914-18. He is particularly interested in 19th- and 20th-century armies that are less well known to the English-speaking reader. Raffaele Ruggeri was born in Bologna where he works and lives with his wife. After studying at the Fine Arts Academy he worked in several areas of graphics and design before deciding to devote himself to illustration. He has long been interested in military history and has illustrated a number of books for Osprey.